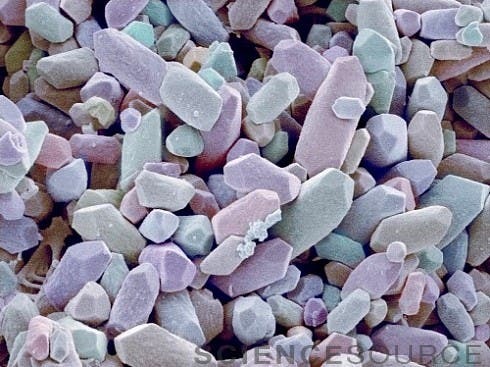 The beautiful colored image above might look like beach pebbles, yet in reality it shows a glimpse from an even tinnier world – it’s a colored scanning electron micrograph (SEM) of calcium carbonate deposited on the surface of an otolith, found in the Acoustic Macula. These tiny debris also fit a purpose, helping the body stay in equilibrium, whether in static (position of the head) or dynamic equilibrium (relative position function of linear acceleration). In fact, they’re often called balancing stones, despite their lack of zen at first glance. Located in the inner ear, the acoustic macula is made up of hair cells (the orange ones on the right-side image), which are the basically the sensory cells that pick up air pressure later translated into sound, and supporting cells (in pink). Each hair cells is made up of between 40 and 70 stereocilia and one kinocilium. The supporting cells secrete a gelatinous substance forming the otolithic membrane, where the stereocilia and kinocilia become embedded, hence the name. This membrane is covered with a layer of those calcium carbonate crystals (shown at top). Each hair cell forms a synapse with a sensitive neuron (in yellow) and a motor neuron (in green) of the vestibular branch of the auditory nerve. This allows us essentially to hear, but also, again, to find balance. 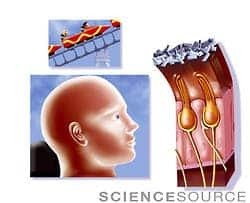 When our bodies are subjected to a sharp acceleration rise, like during a roller coaster ride, the large inertia causes the otolithic membrane and the subsequent otoliths to slide backward, moving the corresponding stereocilia and kinocilia along with them. This in turn stimulates the vestibular nerve, enabling us to recognize movement even when we’re blindfolded.